From how Donald Trump is affecting business in America, to how Tyler Durden’s maniacal wisdom applies to your portfolio, BNN Bloomberg’s on-air personalities have offered up a wide array of choices for this year’s great read. 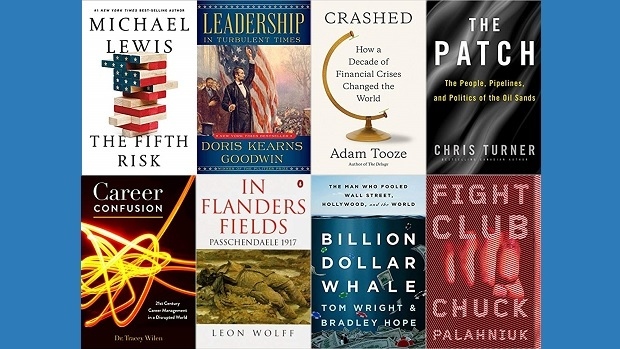 There’s a little bit of something for everyone in this year’s list of recommended titles from some of BNN Bloomberg’s anchors and reporters. Years ago, just at the dust was settling from the wreckage of the 2008 financial crisis, I read Andrew Ross Sorkin’s Too Big to Fail. Sorkin’s book was as good as a rough first draft of history could have been – filled with insider accounts and details of the pivotal moments of the crisis. That crisis, of course continues to shape the world we live in. Crashed is my favourite business book of 2018 because Tooze produced a worthy complement to Too Big to Fail – one that steps back and takes stock of the populist, increasingly isolationist and often nasty mood gripping many parts of the world today. Events that happened long after Too Big to Fail – the European debt crisis, Russia’s annexation of Crimea, and the election of Donald Trump – are all described as being born of the 2008 mortgage crisis. Tooze, a professor of history at Columbia University, has written earlier books on political and economic chaos following World War I and in Nazi Germany, so he’s ideally suited to this task. There’s nothing novel in his premise, of course – we all know the financial crisis caused unprecedented cynicism toward free markets and their institutions – but Tooze’s intellectual rigour adds greatly to our grasp of recent history. “This year, the 100th anniversary of the end of World War I, I’ve been reading about that tragic conflict. One book that shows how conflicting priorities can lead to a disastrous course of action is In Flanders Fields, an account of the horrific third Battle of Ypres. Published in 1958, the book recounts how British Prime Minister Lloyd George had misgivings about yet another bloody assault on the German lines but the military hierarchy under Field Marshal Sir Douglas Haig prevailed by pressing the need to sweep U-boat bases off the Belgian coast. The generals also argued successfully that the French army, which had been shaken by mutinies, was about to collapse and the Germans must be diverted. George felt unable to fire Haig, a cavalry man like many other British military leaders, because it would have sent a fatal signal about British confidence. The book carries lessons on how organizations and individuals can stick doggedly to failed policies, despite ample warnings and evidence of failure, in pursuit of goals that should be revisited. The British suffered more than quarter of a million killed and wounded in the battle. The elite Canadian Corps was deployed at the end and actually captured Passchendaele village, the place synonymous with the bloody struggle. While not technically a business book, over my summer holiday I re-read Chuck Palahniuk’s Fight Club – which of course was made into a film of the same name starring Brad Pitt and Edward Norton. Are there any investing lessons in this tale of a sleep-deprived insurance claim investigator’s decent into anarchy? I think there’s at least one, a line that has always stuck with me: “The things you own end up owning you.” We’re often told not get to emotional about the assets we hold. Is it a stretch to say if we get too attached to those stocks and bonds we own that they will end up owning us, perhaps to our detriment? Pulitzer-prize winner Doris Kearns Goodwin is one of the best-known presidential historians. Her latest book examines the leadership styles of four presidents: Abraham Lincoln, Theodore Roosevelt, Franklin Delano Roosevelt and Lyndon Johnson. While it is not a business book, it does provide helpful context for our coverage of current leaders. The story almost seems too good to be true. How the Malaysian prime minister found himself in the middle of one of the world’s greatest financial scandal that involves Gulf sheikhs, Hollywood blockbusters, A-list celebrities and Goldman Sachs is a tale that is certainly stranger than fiction. At the centre of all this is Jho Low, a mild-mannered Wharton School of Business student, who was able to swindle over US$5 billion through a Malaysian soveriegn wealth fund right under the noses of global financial regulators. Wright and Hope illuminate how this scandal came to be through direct reporting with several key players and detail how the funds were used to finance elections, purchase luxury real estate, throw champagne-drenched parties and even help finance The Wolf of Wall Street. The book should also serve as a precautionary tale for regulators and investment banks that all it takes is a couple enterprising journalists to follow the trail of money and unravel unfathomable levels of fraud - and that a few more checks-and-balances could have prevented this Billion Dollar Whale to swim away with billions. The Fifth Risk offers a close-up look at how the Trump administration has let government functions erode – from weaker data collection to critical roles left unfilled. Lewis typically writes about business – and the risk he alludes to is the damage government can do. It’s relevant for anyone trying to understand the economic and business backdrop of America. It is understandable why there is so much career confusion given the impact technological advances like AI, big data, machine learning, robotics and more are having on society, work and careers. Many are anxious about their career longevity as technology continues to evolve. Wilen provides a framework on how to figure out your career path. Start by identifying what you like to do and what you do well enough to get paid for, Wilen writes. If you can’t figure it out, begin by eliminating what you don’t want to do. Consider where you might work and the qualifications a future employer might be looking for and only consider jobs that you can do today. There is desire to try and prepare for jobs that don’t yet exist, so staying up to date on trends, looking for ways to continue learning and expanding your role through bootcamps and certifications can all help you stay relevant. However, one of Wilen’s best ideas is the “career selfie.” Take a snapshot of where you are now and get focused. Own your career. Recognize you are a revenue stream. Become the CEO of your job. Have a 100-day plan. Develop powerful pitches, meaning succinct communication skills. Have a personal brand. And, develop a web of influence. This book will help you stay ahead of the curve! A must read in 2019. As pipeline politics and the discount on Canadian crude continue to be a national conversation, Chris Turner takes readers to the centre of it all – Fort McMurray and the Alberta oil sands. The area is home to one of the country’s most important resources, which form the basis for products that all of us continue to use every day. However, although once heralded as a key source of industry and innovation, the region has become a lightning rod for environmental activists and a cause of concern for its contribution to Canada’s overall greenhouse gas emissions. Turner’s book breaks down some of the complex, bigger issues from the viewpoints of characters on the ground.